What makes Live Lingua Korean different? Here are just a few of the reasons to study with us at Live Lingua Korean. 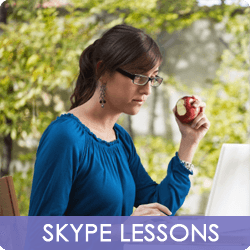 1-on-1 Korean lessons online any day of the week. Our Korean teachers have years of work experience. All of our Korean tutors can speak a second language. Native Korean speaking teachers from South Korea. Each Korean lesson lasts for 60 minutes. Total flexibility for Korean classes. Enroll in as many or as few hours as you would like. Here is what some of our hundreds of students have said about their online Korean lessons. "환영합니다. I have always been facinated by Korea. The history, the culture and the people. My husband is in the military, and I was super-excited when I found out they were going to station us in South Korea. But the only problem was that I could no speak any Korean. In [our base] there was nobody to teach me Korean. Luckily one of my husbands fellow soldiers was learning [another language] with Live Lingua and recommened I try. What a great idea! I signed up right away after my trial class. I am now in Korea, and am still taking classes with them. They are that good!!!"